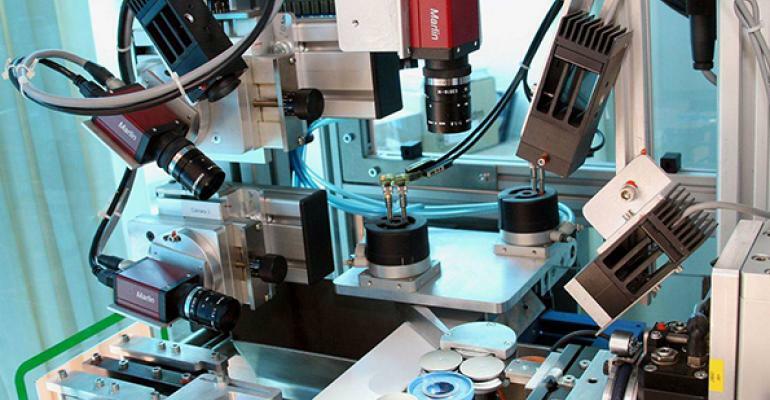 Today sipotek will tell you some brief introduction of machine vision technology and vision inspection systems from machine vision camera manufacturers. The term ‘Machine Vision’ at its most basic is used to describe a system whereby an image of an object is processed using a computer that is pre-programmed to make a decision based on what it sees. These systems are mostly used by machine builders in manufacturing industries as a method of checking the quality of products or components on a production line. They can be found all over the world an in a number of different environment. A factory in England is manufacturing stainless steel washers of various sizes. The production line is very basic. Washers are punched out of large metal sheets where they drop onto a conveyor belt ready to be packaged into bags. One day, a worker finds a bag containing a washer with no hole in the middle! A vision inspection system could be introduced to identify this kind of fault before the faulty washer is packaged. A camera, placed at a point along the conveyor would be triggered to take a picture of a washer as it passes underneath. The image from the camera is relayed to a computer system that is pre-programmed by an engineer to interpret the image of the washer and decide if it is acceptable or faulty. A washer identified as faulty could be removed further down the line allowing only acceptable ones to be packaged. This is a vision system almost at its most basic. They can do an awful lot more! Taking the washer example further; the computer system could be programmed not only to detect the presence of a hole but also check the size of the hole, the size of the washer’s outer diameter, the quality of the punched hole’s edge, roundness, scratches, colour and a whole lot more besides. Moving on from simple washers, a camera system can be used to take measurements and check the quality, alignment and presence of extremely complex assemblies. A more recent use of vision systems is for robot guidance. Many modern car production lines rely on cameras to guide the robot arms in manouvering components like windscreens carefully into place on their vehicles.